This rare antique service station sign is circular in shape. It features a red circle surrounding a checkered red and blue center. 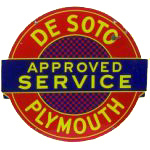 In a banner across the circle is the phrase “Approved Service.” “De Soto Plymouth” is printed on the border of the circle.